I know when you think of November you don't really think of coleslaw but I made a batch of BBQ pulled pork in the crock pot for Sunday night dinner and I always make coleslaw to go with it. We take a hoagie roll, slap a big glob of BBQ goodness on it and then smother with creamy coleslaw, it's delicious and a really inexpensive meal. I splurge and buy the bag of pre-shredded cabbage with carrots instead of shredding my own but I always make the dressing from scratch, it's so much better than store bought and costs pennies to make, a decent brand of coleslaw dressing at the store is at least $3.99 for the bottle. Mix the sugar, lemon juice, vinegar, pepper and salt together until the sugar granules are dissolved, whisk in the mayonnaise until smooth and creamy. 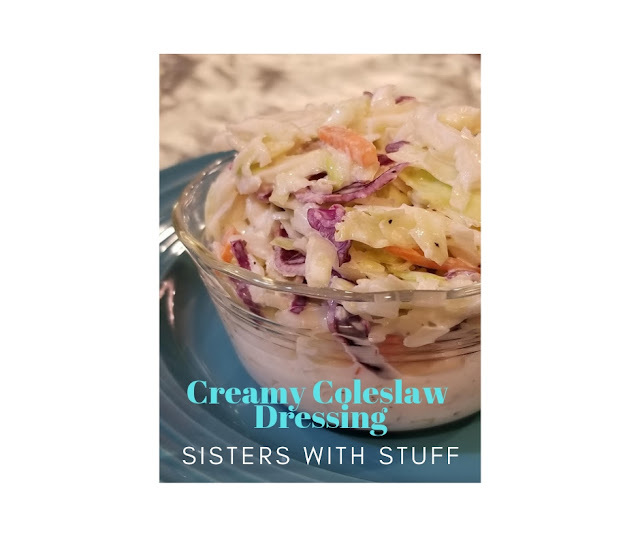 I usually make the dressing and mix in the shredded cabbage about 30-45 minutes before we eat, it lets everything mix together and softens the cabbage a little bit. If you like spicy you could add a little chipotle sauce or cayenne pepper.